S u r f - i T TM - 3D Modeling Kit. We'd also like to note that 100% of our beta testers that responded to a standard questionnaire unanimously agreed that Surf-iT is "superior" to standard 3ds max surface modeling and spline tools, and they all went on to specify details about why and what is superior. "I recently purchased both ResErect and Surf-iT (amazing products) excellent!!! ... I want to thank you for your support. Your company has excellent customer service ... awesome customer support!!!" "Thank you so much for your prompt reply and your genuine interest. It's obvious that true customer service is alive and well at GHOST 3D ... Thanks for Surf-iT, a great product and for your support." "I'm a user of your Surf-iT and have been using your good product with fun." "Great... and I must say that if I was to give you guys a grade for your product it would be definitly an A, without a doubt. I showed alot of your features, with much enthusiasm, to some of our people, and they were very positive." "I purchased Surf-iT (love it), and have been working with it for the past several weeks." "Surf-iT was one of the best Plugins I ever bought, because I use it nearly every day." "For me the primary strength of Surf-it is in the enhanced workflow. The Spline Editor, completely reorganised for efficiency of operation with welcome additions such as the Show End Result that stays on(! ), floating toolbar of essential items, and customisable height to keep everything at your fingertips, makes a huge difference to the speed of modelling and ease of use. The Connect-It modifier is a leap forward from the competition, fulfilling a bunch of wish-list items - saving time and making the life of the modeler that much easier. A very welcome addition to my modeling toolbox that I would be hard pressed to live without." "Definitely, Surf-iT is a superior tool to Surface Tools. Though the Connect-iT and Segment-iT Modifiers within Surf-iT increase the animator's ability to quickly and efficiently create intricate models, the Snap and Anomaly Detection buttons within Surf-iT alone are enough to jump ship from Surface Tools." "Surf-iT expands beyond the current toolset, providing quicker surfacing of splines, more options at the surfacing level, and better compatability with MAXScript allowing me to better tailor the system to meet my workflow needs. Connect-iT's many options make connecting your splines a flexible and powerful process. Add to that the ability to re-order your splines and you have something that is much more intuitive and useful than the CrossSection modifier found in SurfaceTools. After using some of it's options it's hard to imagine ever working without them! The Spline Editor is another nice part of Surf-iT, with Extruding segments definitely at the top of the list of improvements, finally allowing you to start manipulating a spline cage as though it was a solid object. The 3D Spline primitives top things off, giving you a quick base to start with for creating more complex spline cages." "Having had a couple of days to play with Surf-It, I feel I can give it a hearty thumbs up. I think it will improve my attempts at spline modeling no end." "In a nutshell, from what little I've been able to use it, I can say "yes" 'Surf-iT is Surperior to Surface Tools'... I've been doing a little experimenting with Surf It and man is it cool!...The main factor is that by using a group of modifiers Surf-It gives you a more flexible procedural approach to spline modeling.I was up til 3AM playing around with Surf-It and now I'm really starting to get the hang of this tool. The hammer tutorial was really helpful in making it all "click" in my head. You guys have got something really cool here ... what you guys have is a much more powerful toolset and streamlined workflow (very forgiving)." "Thanks again and I really like Surf-It!" "Re: Surf-iT ... I am currently writting an Article about your Plugin for a leading german 3D-Magazine. Beside that I do find your Plugin great. I will send you some of my work, which you can use for your Gallery." "Anyways, I used this file to test the speed of Surf-iT. It is faster than using the Surface Modifier.... By the way, that Snap button is a god send. I like being able to extrude segments as well... Thanks, Edmund"
"From someone who has written more than I want to think about, I wanted to tell you that you are a GREAT tutorial writer! I did the Rosette tutorial in about 1/2 hour, and your directions were absolutely clear as a bell. Thanks!... I understand your excitement! This is a great Max tool! Nice plugin and nice writing." " Re: Surf-iT. WOW! I always knew you guys were talented. Surf-iT rocks!" "Congratulations on your soon to be release [Surf-iT]! That's great news." "Surf-iT is awesome - a real time saver, with exceptional quality surfaces. Anyone who uses Surface Tools should get Surf-iT, they'll easily see how much better Surf-iT is. I've already done several models in just a few days." "I got Surf-iT recently and I was really impressed by the wealth of functionality and ease of use. 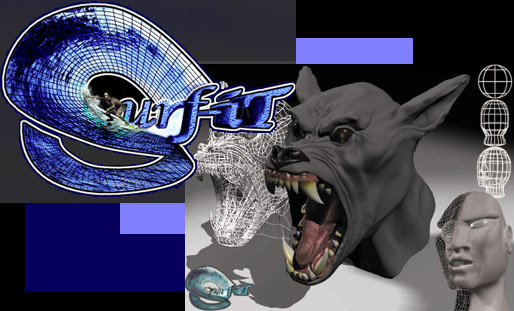 My full appreciation for Surf-iT was realized when I had to create several 3D models for a design my group is doing. I had to create these objects rapidly under a tight schedule, but at the same time they had to be extremely high quality models. Well, I'm proud to say that Surf-iT delivered the goods and more! What an awesome tool! Thank you!" "I modeled a simple sword (an inventory item for out latest game) with no problems. I like the coincident point grabbing feature a lot. Good work." "Done more tests and Surf-iT is the best and preferred surfacing tool available to day. My opinion, for what it's worth, can be demonstrated visually, with the results speaking for themselves. Nice one"
"Surf-it feels quite solid...everything works great." I've seen these guys work, AND I've seen their work - their real animation work... Surf-iT is no exception - outstanding! "Thanks again for the help and the awesome plug...PS: I hope you continue to support this product with each subsequent upgrade....I do a lot of modeling for games and with this plug-in my work got better and life got easier." "Surf-it! is great. Much better than surfacetools indeed. The anomaly detection is very usefull, Surf-it! shapes and macro`s very handy. There is a lot of new stuff for me to discover in there :-)"